Xbox Live and System Link are supported. Split Screen is currently supported. Up to 4 Local Players are also able to join in Xbox Live or System Link games. -Up to 16 players. Host can increase this number. -Up to 4 local players, including guests supported via split screen. -All game modes supported. Dig Deep, Survival and Creative. 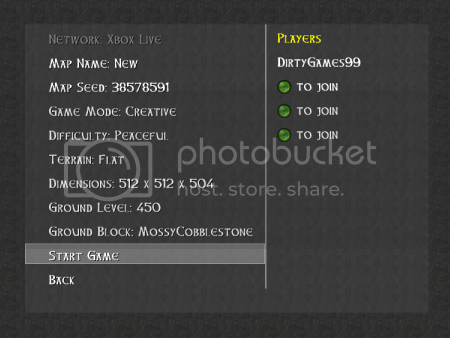 -The Host opens a Lobby screen and controls the game settings and player permissions. -Remote and Local players can join the Lobby or join mid game if it has already started. -Only the host can save the world. -Only the host can change player permissions. -Only the host can kick players. -Only remote players can rate a world. -Any player other than the host can leave the game and the game will continue. -If the Host leaves the game, the game will end. -Player state is stored against the world. So if the same player joins the world at a later date, their state persists. -All Avatars are visible to all players. Avatars will hold the appropriate tool, just like split screen. -Player nameplates show gamertag and health bar. Player nameplates can be turned on/off on the Multi player menu (on the Pause menu). -Headset voice chat is supported, but.. will be proximity based. Probably the closest 4 players. This is needed to reduce bandwidth used by voice chat. If 16 players all talked at the same time there is no bandwidth left for the game. -Only one player can have a chest open at the same time. -Only one player can have a furnace open at the same time. Customizable Creative Map Dimensions, Ground Level and Ground Block. World Ratings are shown so you can easily choose the highest rated worlds. -Edit: Players can add and remove blocks. -Blast: Players can detonate explosives. -Fly: Players can fly (Creative only). Player permissions are interchangeable. i.e. Edit|Fly or Edit|Blast or Blast|Fly. -Invite Player: Allows you to invite a friend or party member to your game. If they are already playing another Total Miner MP game, they will leave that game and join yours. If they are not playing any game, Total Miner will be loaded and they will join your game automatically. If they don't own Total Miner and they accept the Invite, they will download Total Miner and automatically join your game. -Kick Player: Allows the Host to kick any player from the game. That player cannot rejoin the game. -Player Permissions: Allows the Host to manage player permissions. -Rate World: Allows remote players to give the world a 1 - 5 star rating. This will aggregate into the worlds public rating. -Packet Frequency allows you to try and reduce lag if your connection is struggling. 1. Go into the Share Menu. 2. Select Share Your World. 3. Select the World you want to share. 2. Optionally select a Filter. 3. Select the World you want to get. 4. You will now immediately start receiving the world. 1. With the current system, there is no world linked to the share session, so there's no way for the game to display info about the world to people who might want it. And there is no way for the game to allow players to filter the search list. 2. With the new system, because the share is linked to a world, the receivers can see what type of world it is, and they can filter the search list. e.g. only see Dig Deep worlds. 3. Hosting Players won't be interrupted while playing the game to confirm a share. Both v1.0 and v1.1 have basic memory management. Basic in the sense that the game just loads up everything and never unloads. As we all now know, this is not good enough. Players are getting Out of Memory exceptions. The graphics take up most of the memory by far. This is the area we will focus on to reduce the games memory footprint. v1.1 was a little bit smarter than v1.0 in Dig Deep. v1.1 unloaded the bottom lava layer if the player was above depth 1800. This reduces the footprint by about 15 - 20 mb. But it's still not enough. The game now no longer loads all graphics in the background. It now only loads graphics when a player moves into that area. Areas of the map that use a significant amount of memory for the graphics are now remembered, and unloaded when players are no longer in that area. We can still get smarter than this, but as it is now, the memory footprint has been reduced significantly and indications are positive. Another challenge is that memory gets fragmented as the game is played. There might still be 50 mb of free memory, but if its all fragmented into little chunks, we will still get Out of Memory errors if we try to allocate a chunk of memory larger than the largest fragment, even though the amount we try to allocate is less than 50 mb. We need to combat this some how. Dangerous Mobs come out at night. Crafting. No blueprints, all items are craftable from the start. All the rocks and ores from Dig Deep are found underground. Beds can be used to sleep through the night. No punching. Tools are required just like Dig Deep. There is no Peaceful on survival. Normal: You will initially spawn with a single wood pickaxe. You will have shops on startup, but they will only contain items that cannot be crafted and free wood picks. Legendary: You will initially spawn with a single wood pickaxe. There will be no shops. (But shops are craftable if you have the materials). Mobs will be more frequent, hit harder and be harder to kill. It will not be easy to survive on Legendary difficulty. And quite a bit more to be announced. Ducks: Drop feathers and raw duck meat. Sheep: Drop wool and raw lamb chops. Added block picking to Dig Deep. But not stock up. Add option to Creative Mode to toggle block pickups on/off. Option to change the dimensions of a new Creative Map from narrow but deep to wide but shallow. Also gives the option to set the ground level, so you can have more earth, or more air, as you want. New Difficulty on Dig Deep - Legendary: No shops on initial spawn. Damage taken from Falls and Mobs is higher. No blueprint finder. No Map. You cannot change difficulty. These chests will be locked to the gamertag that places them. Only that gamer can open/break them. In MP, if a guest places a locked chest, the host cannot open it, but the host can break it. This list is not final, we will add to it as we go.